When British watercolorist David Cox (1783-1859) first moved to London in 1804, he rented rooms at 16 Bridge Row, described as six doors down from Thomas Palser’s print and book shop. Cox visited Palser regularly, who was one of the first to buy and sell the artist’s work. Visitors to the shop would also find the work of Samuel Prout (1783-1852), John Mortimer (1740-1779), and many others. Caricaturist and military painter William Heath (1794-1840) lived much of his early life at 5 Stangate, Lambeth. 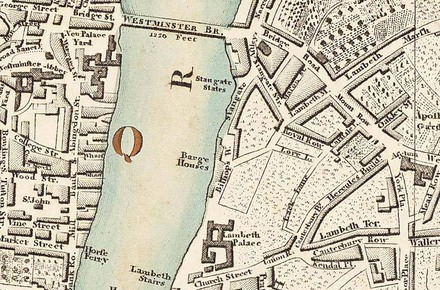 If you zoom in on the map above, you will see that Palser, Cox and Heath all lived at the bottom of the Westminster Bridge on the Surrey side. This was the perfect position to take advantage of the crowds traveling from the wealthy neighborhoods around St James’s and the Strand to the theaters of Lambeth. William Heath (1794-1840), The Artist, 1812. Etching. 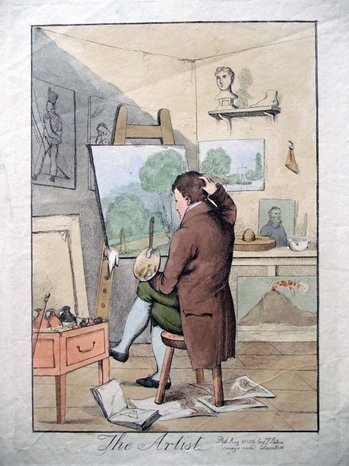 This is a self-portrait of William Heath in his studio on Stangate Street. Fifteen-year-old Heath designed, printed, and self-published eight caricatures during 1809-10 before he gratefully joined Palser’s shop. He was one of several local artists who benefited from their neighbor’s help with promotion and distribution. During the 1790s, William Blake (1757-1827) and his wife lived a few block away at 13 Hercules Buildings (now Hercules Road) and knew the Palser family (Thomas’s son became an important collector of Blake’s drawings). 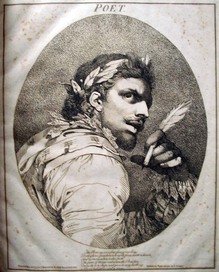 In 1800, the bookseller and satirist William Hone (1780-1842) opened a book and print shop with a circulating library a little further south in Lambeth Walk but was not as well situated as Palser and soon moved across the Thames. 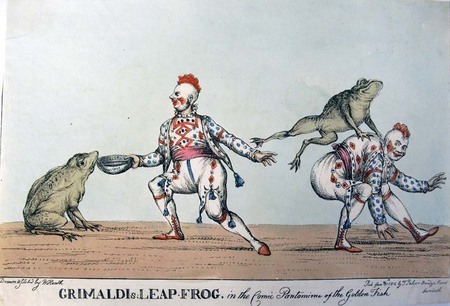 The performer Joseph Grimaldi Senior (died 1788), father of the famous clown Joseph Grimaldi (1778-1837), lived down Stangate street from Heath. 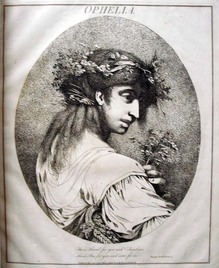 The Grimaldi family retained the house and that relationship probably led Palser and Heath to publish a series of prints celebrating Grimaldi’s Covent Garden successes in 1812. Poor reproduction of John Bromley’s The Lambeth End of Westminster Bridge, ca. 1800. Found in Country Life November 1983, p. 1319.